This great all-in-one kit includes everything you need to take your work out of the studio or shop and on the road. 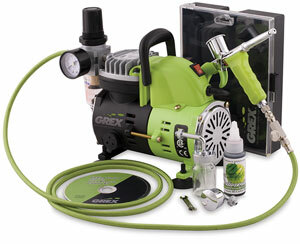 This starter kit includes the Genesis XT airbrush with 7 ml (¼ oz) and 15 ml (½ oz) side gravity cups, AC1810 air compressor, 6 ft nylon braided air hose, side siphon attachment with 30 ml (1 oz) bottle, 30 ml (1 oz) airbrush color, G-MAC air control valve with quick disconnect, airbrush nozzle wrench, airbrush carrying case, and a "How-to-Airbrush" DVD. The XT Airbrush features a gun trigger format for "pull" action rather than push. You will not find a more comfortable spraying position. Its double action, 0.35 mm fluid nozzle, side gravity feed sprays a fine line to 1½". ® Grex is a registered trademark.™ G-MAC is a trademark.